I have a rather vivid, almost child-like imagination. Not quite Alice down the rabbit hole extreme but I like to think I know how to dream. I’m always thinking of new ways to decorate, different organising tricks, recipes, cake decorations, places I want to go, things I want to do… oops lost in a little dream there. I’m sure you get the point. I find it hard to sit still for very long. I just love doing things way too much! 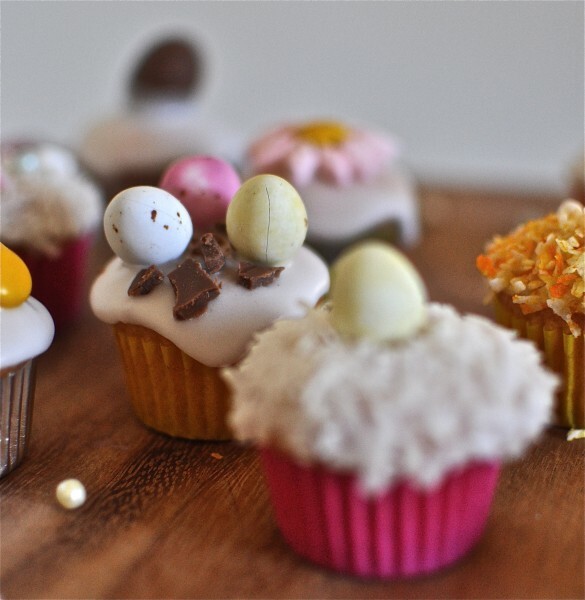 Cupcakes were the lasted victim (or happy recipient) of my lasted bout of inspiration/can’t-sit-still moment.With Easter just a few days away I hope my cupcakes might inspire your creative side to come out. Unfortunately, the cross over from my imagination to reality sometimes results in a little bit of idea deterioration which is the case with this slightly possessed looking bunny cupcake but combine him with a few other Easter treats and he doesn’t look quite so scary.I think it’s the giant shiny eyes that make him a little bit creepy. They have a bit of an evil glisten. 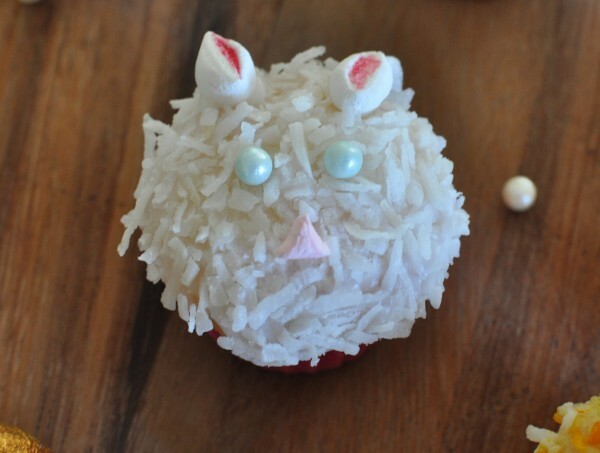 If you want to make your own evil bunny cupcakes you will need some white and pink mini marshmallows, pink food colouring, coconut, icing sugar and water and cupcakes of course. I made the icing my mixing icing sugar until it was nice and thick. It’s best to work with one cupcake at a time because the icing sets pretty quickly. 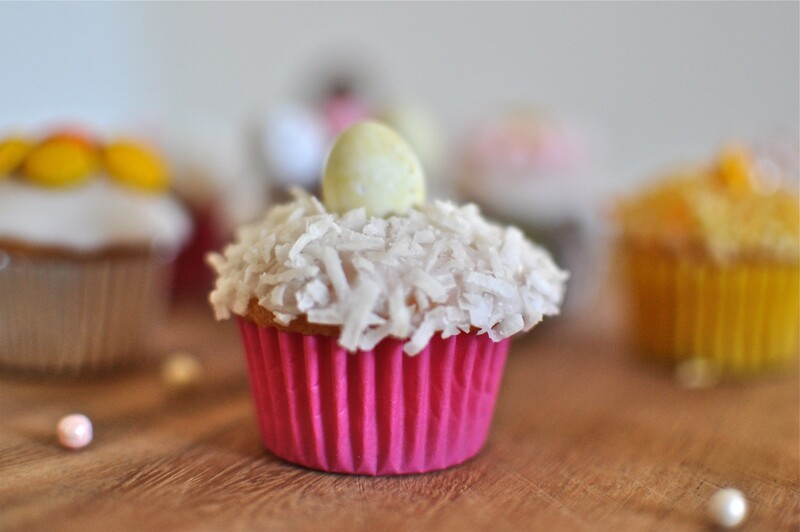 To top them in coconut, dip the top of the cupcake in a bowl of coconut straight after icing. I made the ears by cutting a marshmallow in half and dipping the cut side in a little bit of watered down pink food colouring. Then I pinched the ends in a little bit to give them the ear shape. His nose is a pink marshmallow that I snipped to make into a triangle. Little Mr Chicken looks slightly less scary than Mr Bunny. I died the coconut yellow before dipping this cupcake in it. To make the beak, I snipped up a white marshmallow and then dipped it in yellow food colouring. Don’t leave it in the coloring. Marshmallows don’t really like getting wet – they tend to dissolve. 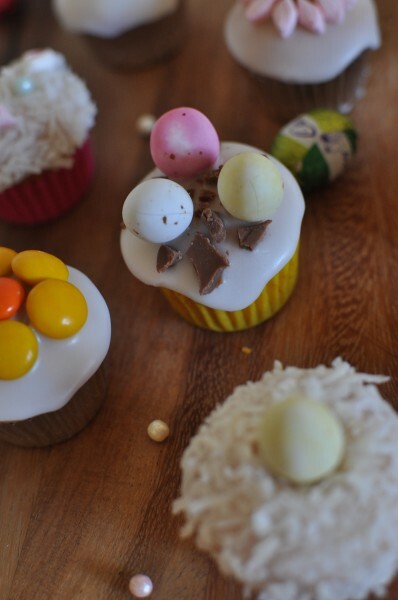 The bird’s nest cupcake would be even better with a crumbled flake bar but I was working with what I had so a broken Easter egg did the trick. 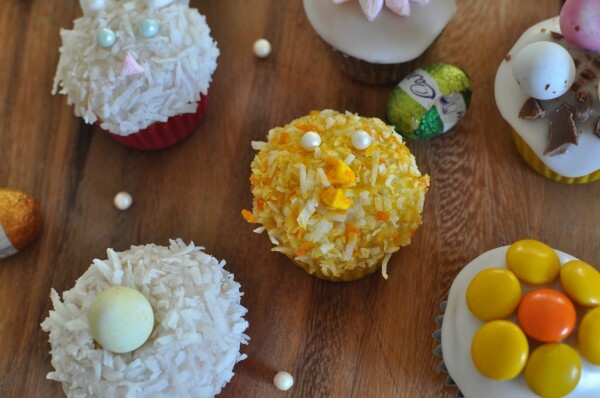 Wait until the icing is nearly set to put the eggs on top or they’ll just slide right off. To make the flower cupcake, snip marshmallows in half and then pinch in the ends to make a petal shape. The rest of them I sort of just made up as inspiration struck. All together on a plate they looked pretty cute if I don’t say so myself. What about you? 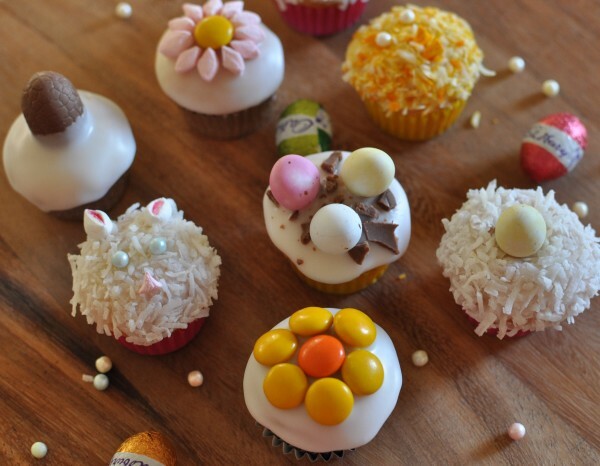 What have you made for Easter? They are so pretty Claire! 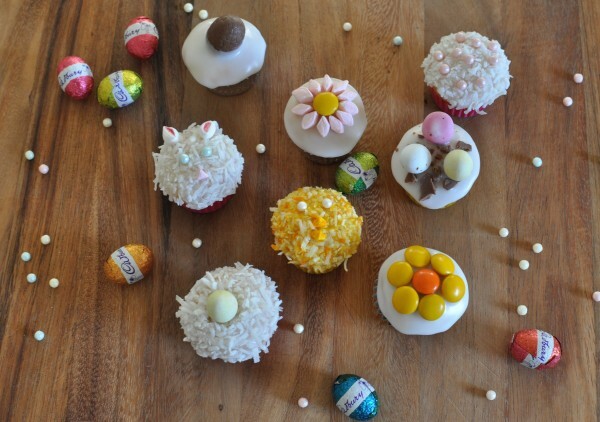 I loved the the flower and the Easter bunny cupcakes! Thanks Monique! I think the flower was pretty cute too. Thanks Lisa. I like to keep it simple. I’m not quite patient enough for some of the ideas out there! They look fabulous Claire! You’re being way too modest!